We’ve covered many thermoelectric beverage coolers in the past, but none come close to the insane power of the AbsolutZero. [Ilan Moyer] set out to design a beverage cooler that chills a drink from room temperature to 5 degrees Celsius as quickly as possible, and it looks like he succeeded. The AbsolutZero consumes around 2.5kW of power and runs 8 water-cooled thermoelectric modules to quickly chill a drink. [Ilan] put his machinist skills to work and fabricated many custom parts for this build. He machined water blocks for each thermoelectric cooler out of solid copper which draw heat away from each thermoelectric cooler. He also fabricated his own bus bars to handle the 200A+ of current the system draws. 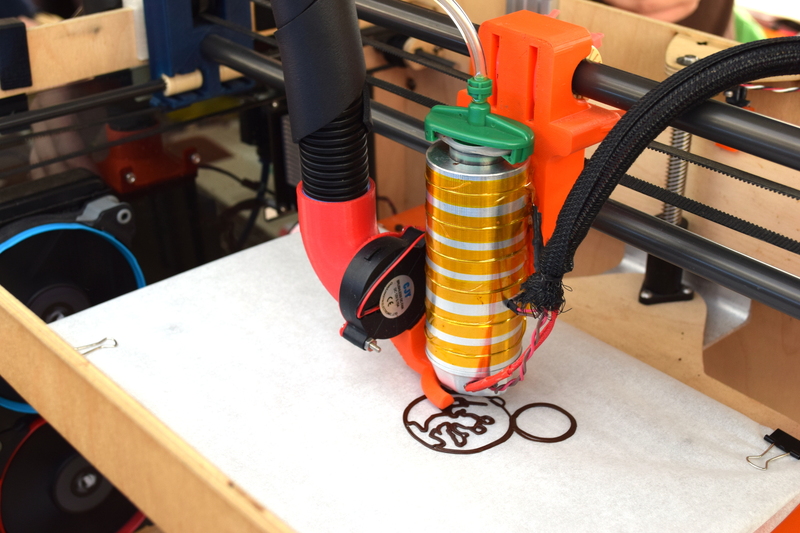 To transfer heat from the beverage to the thermoelectric modules, he turned and milled a heat spreader that perfectly fits a can of any beverage. [Ilan]’s design uses a closed-loop water cooling system and 4 radiators to dissipate all of the heat the system produces, which is quite a lot: thermoelectric modules are typically only 10-15% efficient. The whole design is buttoned up in a custom polycarbonate enclosure with a carrying handle so you can conveniently lug the massive setup wherever quickly chilled beverages are needed. Be sure to check out [Ilan]’s build photos to see his excellent machining work. Thanks for the tip, [Stefan]. Pain is a good thing. It tell us to pull our hand away from the stove and to stay off a turned ankle. But we all have different experiences of pain, and chronic pain degrades our quality of life. A person’s reports of pain will vary from one day to the next based on many factors, so the 1-10 scale isn’t universally effective in determining a person’s pain level. [Scott]’s entry into The Hackaday Prize is based on the classic cold pressor testing device, which measures changes in heart rate and blood pressure in a patient while their hand is immersed in ice water for one minute. [Scott] has tentatively dubbed his device The Pain Machine, but it does more than the typical cold pressor apparatus; it also delivers simulated pain relief in the form of warm water when the valves are reversed. In addition, the subject under testing can push a button when they’ve had enough. While his original plan used external sources of hot and cold water, [Scott] pulled a couple of Peltier coolers from some wine chillers for a more contained design. 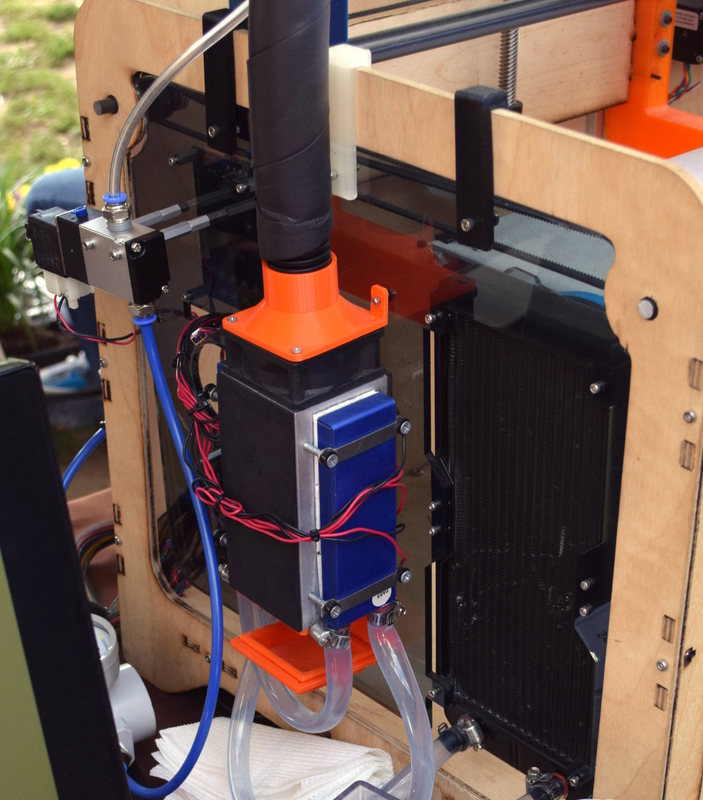 The Pain Machine uses an Arduino ATMega 2560 to control gravity flow solenoids, collect temperature data, and send the data cloudward. A couple of 110V pumps circulate the water. [Scott] will open up the code once he has finished commenting it and fleshed it out with use cases. For now, you can check out his two-minute entry video after the break. 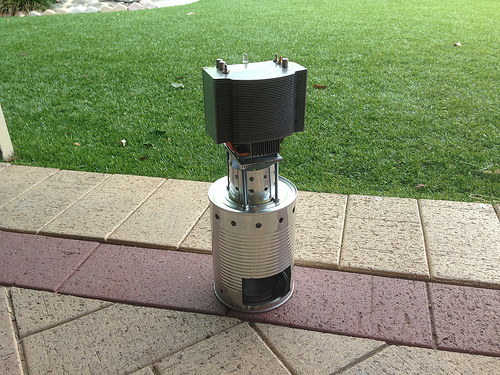 Here’s a thermoelectric generator which [x2Jiggy] built. The concept uses heat from a flame, biased against cooler temperatures produced by that huge heat sink making up the top portion of the build to produce electricity via the Peltier effect. The build is passively cooled, using a sync assembly that takes advantage of heat pipes to help increase the heat dissipation. A nearly flat heat sink makes up the mounting surface for the hot side, which faces down toward a flame driving the generator. [x2Jiggy] started the project by using a can, wick, and olive oil as the heat source. He managed to get about 2V out of the system with this method. What you see here is the second version. It swaps out the olive oil lamp for an alcohol stove. The cans with holes punched in them act as a wind screen while also providing a stable base. This rendition produces about 3V, but it doesn’t sound like there are any precise measurements of what it can do under load.